This CompTIA Recommended Product Includes a Network Simulator and Free e-books on the CD! 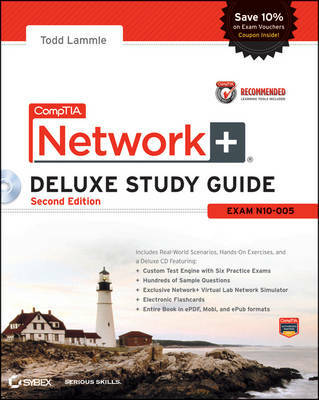 If you're preparing for CompTIA's new Network+ Exam N10-005, this hardcover, Deluxe version of the CompTIA Network+ Study Guide, Second Edition, is the premium study aide you need. Not only does it give you the 100% coverage of all exam topics and all the study tools you'll find in our regular study guide, this content-rich version adds even more practice exams and flashcards, as well as the exclusive Network+ network simulator, so you can practice hands-on without investing in pricey equipment. Prepare for the exam and find valuable bonus material with the new CompTIA Network Deluxe Study Guide, Second Edition.